Three Sinha Group of Companies, an organisation that constantly strives to break new barriers in the roller door industry won the Gold Award in National Level, Large Category, Manufacturing Sector at the CNCI Achievers Award 2018 organised by the Ceylon National Chamber of Industries. 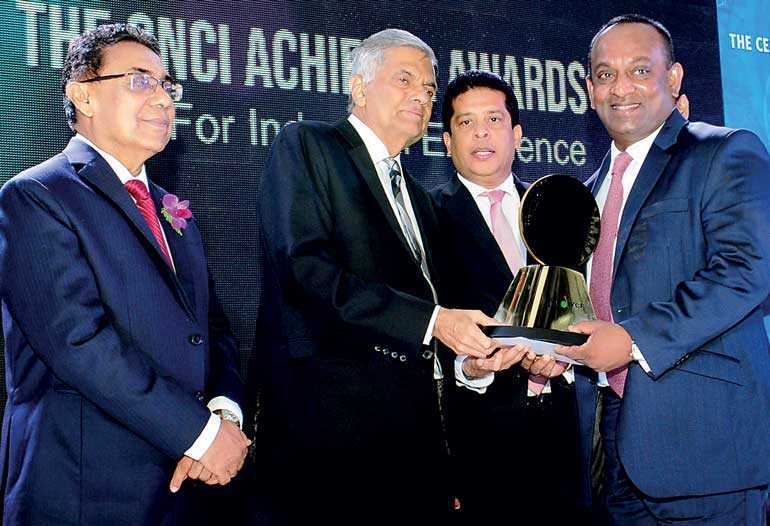 Three Sinha Group of Companies Managing Director Manjula Ariyakumara received the prestigious Gold Award from Prime Minster Ranil Wickremesinghe at the gala event in Galadari Hotel. Three Sinha has introduced a range of roller door products to the market, namely roller doors, roller shutters, sectional overhead doors, window shutters, fire resistant doors, aluminium fabrications, sensor doors, stainless steel, steel railings and stairways, poly-carbonated canopies, stainless steel pantry cupboards, rack systems, steel buildings, automatic barriers and motor operated sliding gates and swing gates. Three Sinha also has the distinction of being an ISO 9001:2008 certified organisations. Solar power systems and hot water systems are the latest introductions of Three Sinha Group of Companies. Having commenced operations as a small scale industry, Three Sinha has risen to the esteemed ranks of having won several awards at the national and provincial levels. Three Sinha Group of Companies was honoured with the distinction of being awarded the ‘Manufacturing Excellence’ title from Sri Lankan Institute of Architects for 10 times. In 2015 Three Sinha received the Gold Medal for Industrial Excellence from The Ceylon National Chamber of Industries (CNCI). They also received Silver and Bronze Awards at the ‘Entrepreneur of the Year’ award ceremonies organised by the Federation of Chambers of Commerce and Industry of Sri Lanka (FCCISL).